Saying goodbye to Mr George Barris, King of Kustoms, who passed away on November 05 – 2015. His Custom Car legacy will live on forever. November 6, 2015. This is the morning after I heard George Barris passed away, just two weeks sort of becoming 90 years old. A very sad day. But thinking back in time, seeing the 80 plus years old George still traveling all over the world doing the things he liked to do best. And every where he came he was welcomed by many fans. Knowing he was still doing well when the 500 page book George Barris King of Kustomizers, about George his Custom Car legacy was finished after 5 years of hard work by his son Brett Barris. I think we can say that George has lived his life to the max. We all knew George his health was not anymore was it used to be the last couple of years. But somehow George was always there, he still traveled to many shows accompanied by his family and Tony Wood, his personal assistant. It seamed George Barris was one of those people who would just live forever. The November 05, 2015 message, “have you heard, George Barris passed away” came as a total shock. I searched the internet to find messages confirming this might be a hoax… but I could not find such a thing, all I found was messages from people saddened about the King of Kustoms passing. 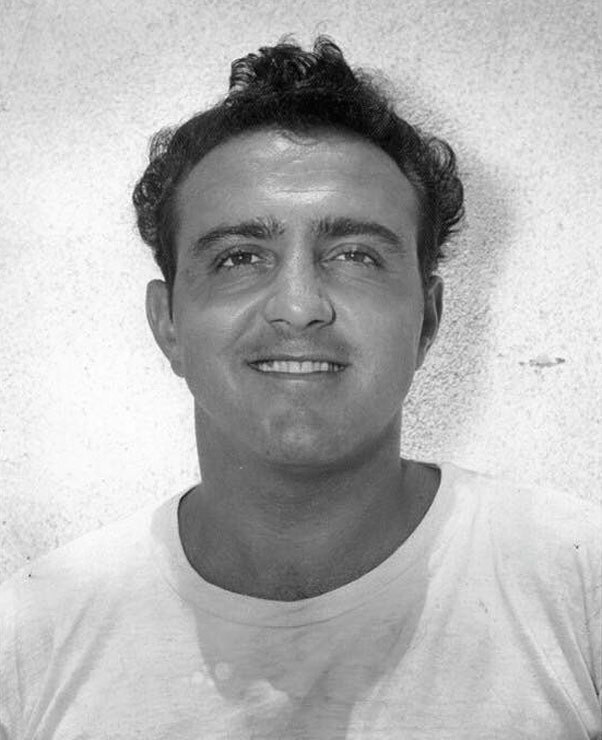 When Brett Barris confirmed his fathers passed away earlier that day I felt sad, very sad. One of my Kustom Car hero’s, perhaps the most important of them all was no longer with us. One of George his first full Kustoms was this 1936 Ford convertible (front) which he restyled while working with Harry Westergard. Harry created the one in the back for a customer. I do not remember exactly when I first heard about the name Barris and specifically George Barris, but I think it was on the AMT model car kits from my father. He had built some of those when he was younger, and always built the kits in their factory stock form, leaving all the Kustomizing parts in the box. When I started to show an interest in cars he gave me his “left overs” from those old 1/25 scale kits. I loved those old Kustomizing parts. The boxes and instruction sheets had photos of George Barris and how he had designed all those customizing parts. This must have been somewhere in the late 1970’s. It would take a few more years before I realized who George Barris was, and how much impact he would have on my life. George (with goggles) working on a clients 1946-48 Mercury coupe at his Bell, Ca shop. I think its fair to say that when somebody says Custom Car, most people automatically think about Barris. 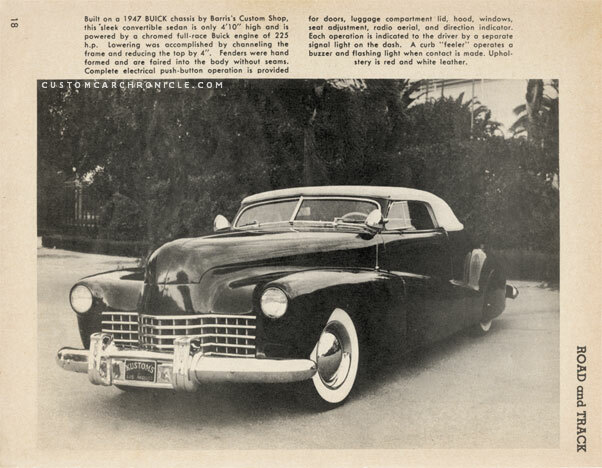 Barris Customs, first written with a “C” and later in the late 1940’s early 1950’s with a “K” can be accounted for putting the Kustom Car on the map. And most of this was done by a young George Barris who had a natural feel for style, balance and above all marketing. George Barris realized that if he would get the Barris Kustom creations in the popular car shows, winning top awards and getting them in as many publications, this would make the cars he loved so much popular with a bigger crowd. Which would be good for business, for him, his Barris Kustoms shop, but also for a lot more people involved in this hobby. If he has foreseen the current state of the hobby back in the late 1940’s when all this happened, I don’t know. But knowing George always captured the moments with his camera and pencil, archived as much as he could, and hung on to it till the end, I think he knew all along, how big this all was going to be. But for him this most likely was just a natural thing to do. We owe George Barris a lot for knowing what to do back then, capturing the moments and sharing it at the right time. Without him and his sense of writing and capturing Kustom Car history, the world of Kustom Cars would have looked quite different today. Thats is something we can say for sure. The Barris shop on Atlantic Blvd in Lynwood around 1953-54. George with his personal 1956 Lincoln Continental Mark II. From very early on, George knew what he liked when it came to styling. Together with his brother Sam they talked about styling a lot, and how they loved the lines of man early 1940’s European cars, and how they could incorporate these styling elements into their American vehicles. 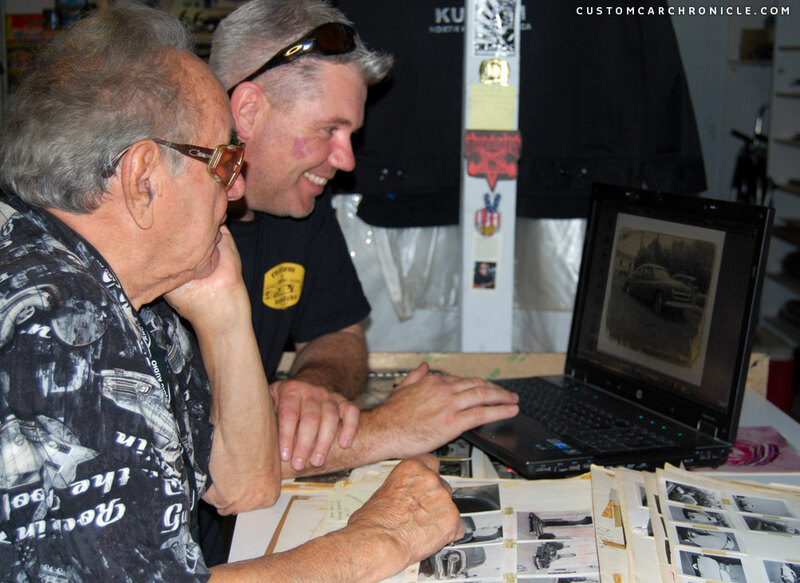 George Barris learned a lot from Nor Cal Kustom legend Harry Westergard, who himself was inspired by the “fire” in George his will to learn how to restyle cars. From George his early rides it can be clearly seen his eye for style and balance, and over the years this would only refine, until the rules for the hobby where dictated by the car shows. George posing with two of his creations in the early 1960’s. The photo of the left shows George with one of the many AMT model kits he helped design. I have read a lot of comments about the passing of George Barris on the internet in the last couple of hours. Most start with words as George Barris, best know for movie cars like the Bat-Mobile etc. To me personally George Barris is best known for the cars that came out of the Barris Kustom Shop in the 1940’s and 1950’s, and perhaps early 1960’s. To me these years are the golden years of Kustomizing, and George Barris has set the standard for these years. He might perhaps not be the inventor of many of the style elements used on cars from this era, but he sure is the one who made the style popular, and made sure the style was spread all around the US, and even far beyond. After this personal favorite era George Barris moved on, and knew how to stay on top of it all to adapt to a changing world. Where many others have failed to stay in business, George his skills in marketing and visionary way of thinking kept him and his business going, and even going stronger. These later Barris years might not be my personal favorite, but I have great respect for what George Barris accomplished in those years. From many movie cars and other ventures, to promoting Kustomzing to the younger generations with his model cars and toys. Brett Barris has just created the Art of George Barris book, which has 500 pages filled with George Barris and Barris Kustom Shop material. And as great as it is, the book is far from “the complete work of Barris”. My guess is that it would take at least two more of those books to cover it all, to share as many of the cars that have been produced by the show and share are the influences Barris has had and still has on the world of Kustomizing and Hot Rodding today. 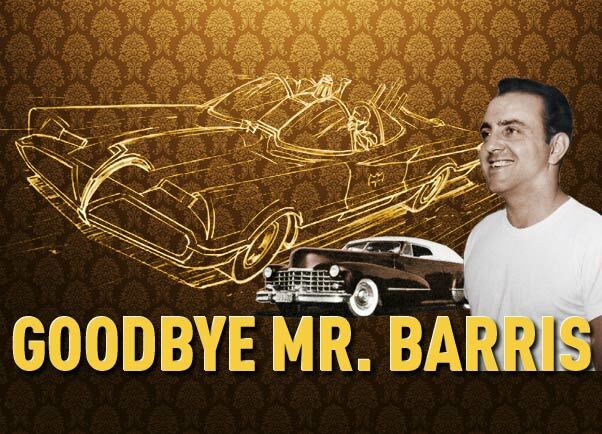 The impact George Barris and Barris Kustoms has had on the car industry is huge, his legacy is enormous, he might be gone now, but will never be forgotten. Barris Kustom City shop in North Hollywood in the early 1960’s. I have met George Barris several times, but the most special time was in October 2010. Palle Johansen was the new caretaker of the Jack Stewart 1941 Ford, and as part of his research into the history of the car, he planned a trip to the US to gather as much information from everybody ever involved with his car. Palle invited me to come along with him to help him with his quest. One of the visits we arranged was a meeting with George Barris at the Barris Shop. Before that meeting we had already spoken with Jim Street, Bob Drake, Jack Stewart and Junior Conway, and already had gathered many stories, facts and photos of the Jack Stewart Ford. When we arrived at the Barris shop we where welcomed by Brett Barris and Piero DeLuca, who showed us around at the shop until George arrived. Palle showing George the material we have already been able to find on the Jack Stewart Ford from Jim Street’s, Bob Drake’s and Jack Stewart’s interviews. George was impressed, and inspired. When George arrived we shook hands, and at first there was not really a click. Which we understood, knowing George had interview and meeting like this many times a day. But after sharing some of the info we had already gathered about the car, and talking about Jack and Jim, George started to open up. He understood we were on a mission, and especially the fact we had talked with Jim Street really sparked his eyes. George talked very highly about Jim Street and tried to remember as much as he could about the Jack Stewart Ford. While looking at the scans we had taken of old photos shared by Jim Street, Bob Drake and Jack Stewart he started to remember more and more details, and his eyes started to get slightly wetter all the time. It was clearly George really enjoyed going back in time to 1950-51 and relive the good old times fed by the material we were sharing. We had a really wonderful meeting with George, but after some time he had to leave, on to his next appointment. We said goodbye to mr George Barris and spend the remainder of the day with a huge smile on our face. 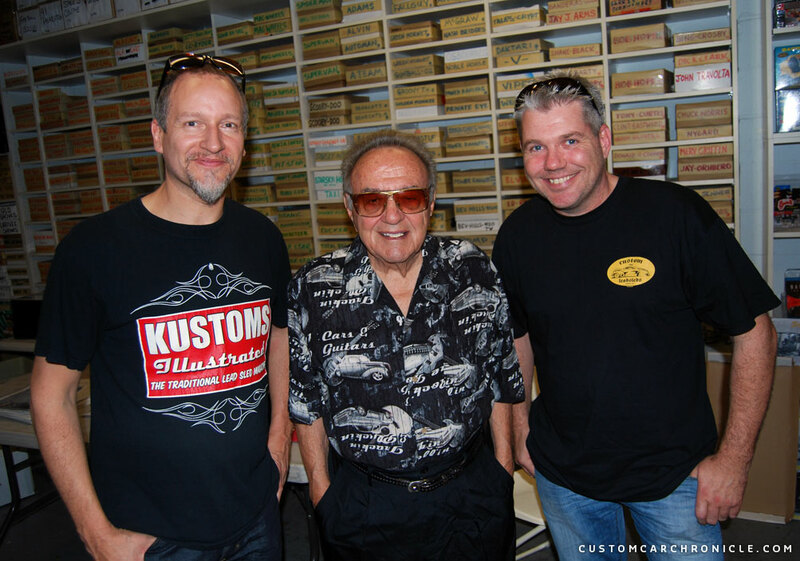 Rik Hoving, George Barris and Palle Johansen in 2010 at the Jack Stewart Ford Research trip in the Barris shop in North Hollywood. George was born in Chicago on November 20, 1925. He was the son of Greek immigrants James and Fanicia Salapatas. A few years later and after brother Sam was born their mother died. George and Sam Barris were then lovingly taken home by their mothers brother, John Barakaris, and his wife, Edith, in their home in Roseville, nearby Sacramento California. 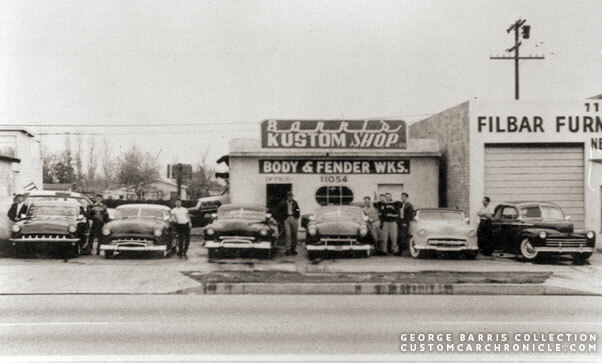 The family name was later changed from Barakaris to Barris.As a young kid George started to make model cars out of wood, en at age 13, George and his brother restored a 1925 Buick, their very first “Kustom” job. 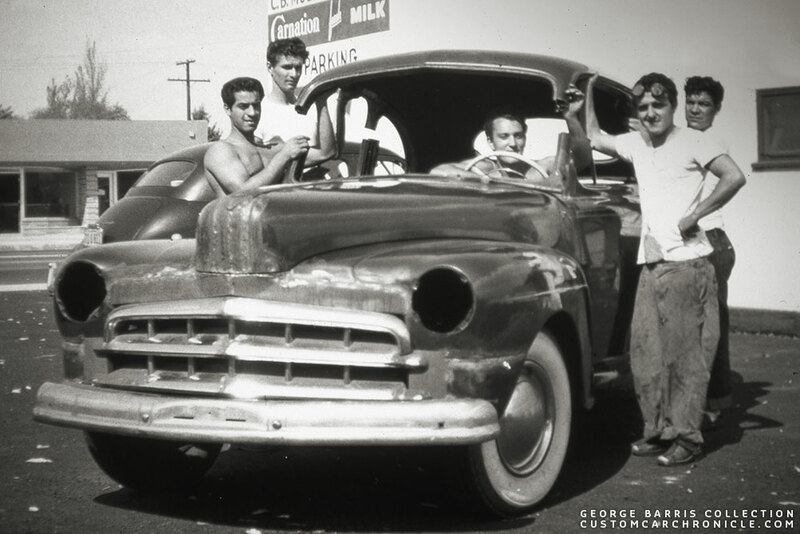 After school George started to hang out at local body shops, including the one of Harry Westergard. Here he swept floors and watched the mast at work absorbing every technique. Harry noticed how eager George was and was very happy to leanr him all the fine details of the trade. George started to work on his own car, a 1936 Ford convertible, which he finished while working part time at the Harry Westergard shop. 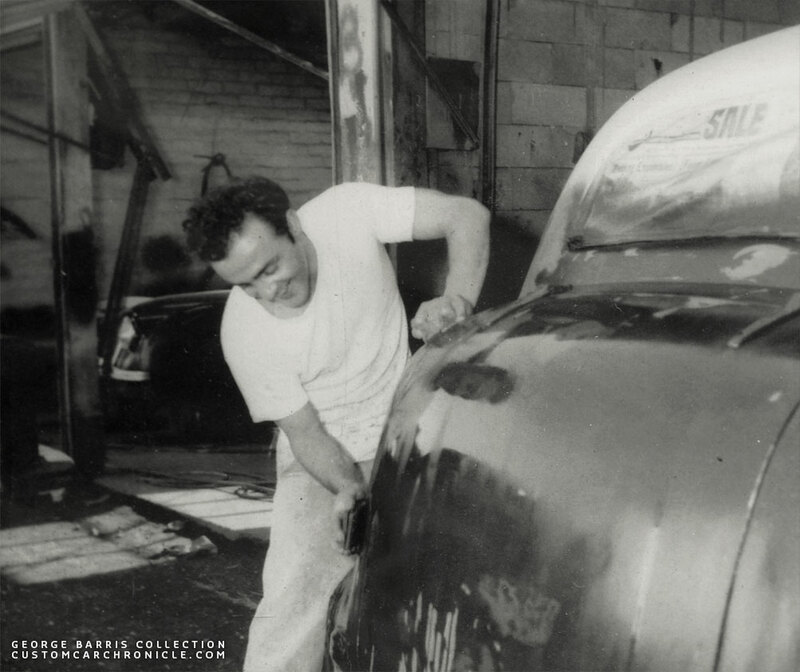 In 1942 George moved to Los Angles, started to work at local body shops and eventually opened up his own body shop where his brother Sam would join him after he had returned from the service. After having a bit of a touch start the body shop blossomed in 1948 after George his 1941 Buick won at a local Hot Rod show and was featured in Road & Track magazine. A larger shop was found in Compton which was birthplace of many late 1940’s classic Barris Kustoms. In the early 1950’s the brothers moved to their famous Atlantic Blvd. shop where a lot of their magic happened. George his 1941 Buick in the 1948 Road & Track magazine changed is all for the Barris Shop. George at work sanding a body on a custom at the Atlantic Blvd. Shop. By now George also had started to write Customs with a “K” and cars like the Hirohata Merc, the Kopper Kart, the Aztec and many other famous creations were created at the shop giving the Barris name world fame. After the devastating shop fire in 1957 The shop was rebuilt and soon moved to North Hollywood where George would start creating cars for the movie industry, which turned out to be a brilliant move. Sam Barris had moved back to the Sacramento area by then. In the 1960’s the Barris shop created cars as the Bat-Mobile, the Munster Koach and many famous cars for famous movie actors. Since his first magazine feature in 1948 George understood the importance of magazine promotion. So ever since he has tried to gain as many magazine features as possible. He even started to take his own photos, step by step how to’s and full features or Barris created Kustoms. 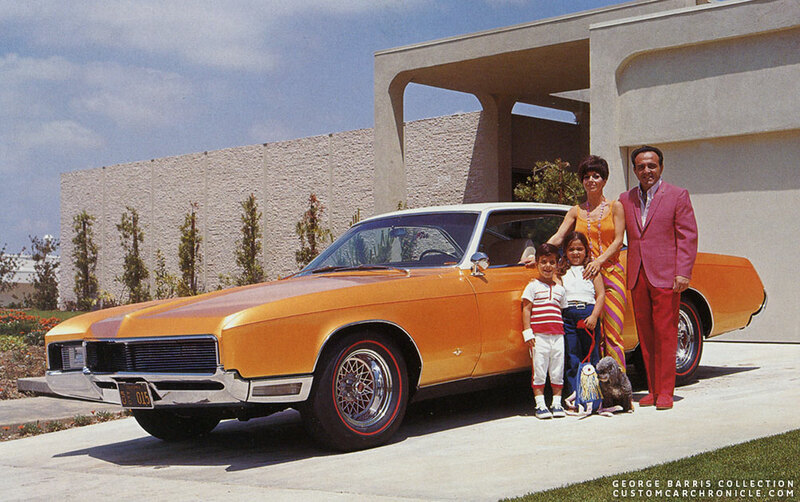 This all lead to the fact that Barris became a household name for Custom Car. George soon would be dubbed King of Kustoms. In those years George his wife Shirley stood besides him and together they ran the business, which expended in many directions. Over the years there also have been some negative associations with the Barris name. Inaccurate claims of having done work on cars, which in fact was performed elsewhere, incorrect write ups in magazines etc. But in more recent years George tried to rectify as much as possible and give credit to the people who deserve it. George his wife, Shirley, passed away in 2001. His survivors include a daughter, Joji Barris-Paster, his son, Brett, and grandson, Jared. 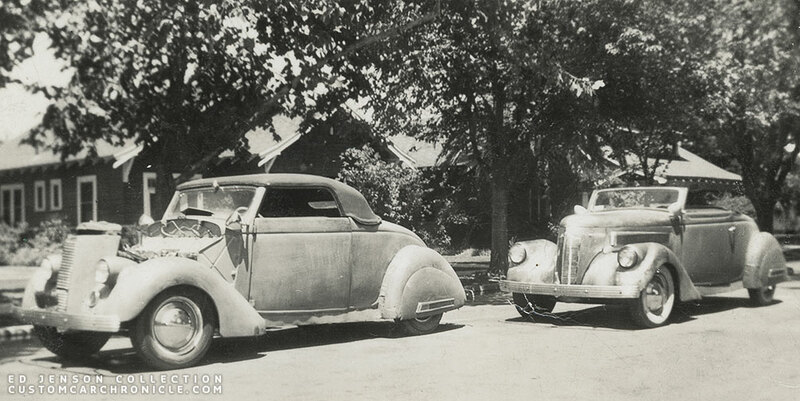 The Barris Stories on the Custom Car Chronicle. In the past few years we have run the Custom Car Chronicle we have already created some wonderful articles around cars created by the Barris Shop and or specific cars from George Barris himself. We plan to continue to create in-depth articles and try to document as many Barris Kustoms Restyled Customs as possible. We will highlight on the Barris Golden years, 1940’s, 1950’s and up to the early 1960. Perhaps with a few exceptions into the mid 1960’s. We will work hard to create many more Custom Car Chronicle articles about these fantastic Barris Kustoms and related stories, and document them in the best way possible. With our re-search so far we have already made many new discoveries and exposing many detail of rarely seen Barris Kustoms. I got to know George through my friend Tony Wood. I thought he was always a great guy willing to answer my questions and will miss seeing him at the shows. Great memories and a wonderful legacy and a huge inspiration. I was the first person to have George Barris at the Grand National Roadster Show 2010..Sign my Original Barris plaque and he yelled were the F%#* did you get that from in front of the crowd of people waiting……..
After seeing the box of rare and original Barris stuff I have collected over the years he was so happy to have so many people there to see him at the show and talk Kustoms……..
Gosh George I just felt you would live for ever ………. I promise i will continue to build Kustoms no matter how hard things get. As I said in an earlier post. In many ways this is like a death in the family. Known to a wider audience as the creator of the Batmobile as well as other movie cars to me like yourself Rik, I will always remember the earlier customs and continue to draw inspiration from them.